McBride’s RV storage facility has many priorities. But priority number one is the security features that protect the business and its patrons. While most storage yards use only 6 foot chain link fences for perimeters, this facility features 13 foot solid block walls. The unusually high walls deter vehicle theft, vandalism and every sort of devious trespassing. Not only does the 13ft high wall deter trespassers but it blinds most on lookers to what is inside the facility. From the street you cannot identify the nature of the business because you can’t see any RV’s. The entire facility is brightened with stadium lighting at night.? 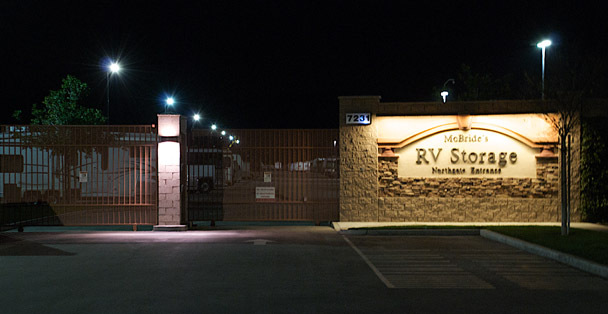 These extra bright lights offer a higher level of personal safety for tenants visiting the facility after dark. It also provides more than adequate lighting for the video surveillance cameras. 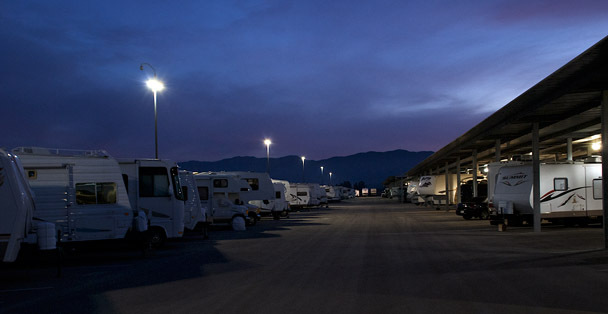 With stadium lighting customers can access their storage spaces with ease at night time and have plenty of lighting to use any of the onsite amenities at any time.